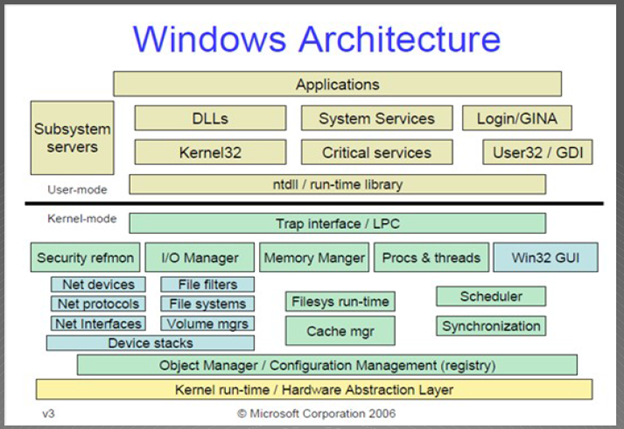 This write up summarizes the basics of various kinds of attacks available for exploiting the windows kernel as of this date. It describes and demonstrates some of the very common techniques to illustrate the impacts of bypassing kernel security and how the same could be achieved by exploiting specific flaws in user mode applications/software. A knowledge of basic buffer overflow exploits through user mode applications is a plus when understanding kernel exploitation and memory issues. A plethora of attacks have illustrated that attacker specific code execution is possible through user mode applications/software. Hence, lot of protection mechanisms are being put into place to prevent and detect such attacks in the operating system either through randomization, execution prevention, enhanced memory protection, etc… for user mode applications. 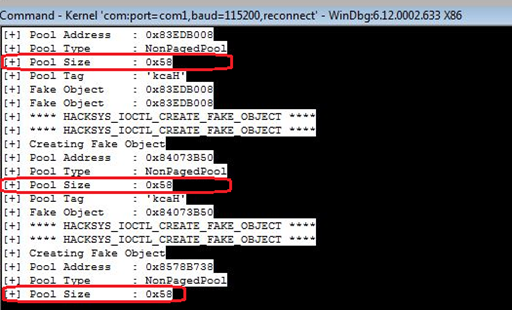 All the demonstrations were provided on Windows 7 Kernel where a custom built HackSys driver [intentionally vulnerable windows driver:HackSys] was exploited to show Kernel level flaws and how they could be exploited. Note: set the create pipe path in debugger as \\.\pipe\com1 and enable the same in debugee. At first we write the buffer with a large enough value so as to overflow it and overwrite the EIP. This shall give us control as to where we want to point for the next instruction. We proceed by using all A’s and successfully crashing the stack. However, to find the exact offset of the EIP overwrite. This can be done, by sending a pattern and finding the offset of EIP overwrite. For our unique pattern of characters used as input, this pattern and hence the EIP offset is at 2080. A protection mechanism to defeat stack overflows in the kernel was proposed as a Stack Guard. With the implementation of this method, en executing function has two main components such as – the function_prologue and the function_epilogue methods. StackGuard patch adds code at the RTL level to the function_prologue and function_epilogue functions within GCC to provide the generation and validation of the stack canary. 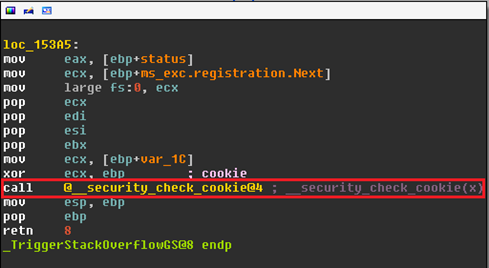 Referring to the program above, we find that every time we overwrite the stack in the conventional way, we will have to over write the Stack Cookie as well. So unless we write the right value in the canary the check in the epilogue will fail and abort the program. This is also called the Write_What_Where class of vulnerabilities in which an attacker has the ability to write an arbitrary value at arbitrary memory location. If not done accurately this may crash(User Mode)/may BSOD(Kernel Mode). These kind of bugs are difficult to find as compared to the other known types but can prove to be very useful for an attacker for seamless execution of malicious code. There are various places where the attacker value can be written for effective execution such as HalDispatchTable+4, InterruptDispatch Table, System Service Dispatch table, and so on. Below is a sample structure containing the What-Where fields initialized to Null pointers. 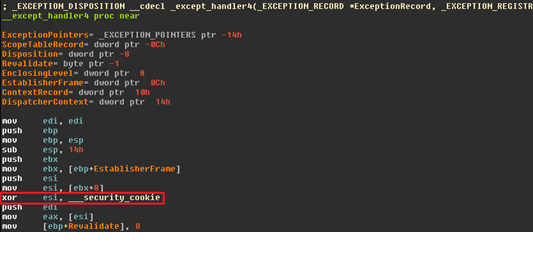 After triggering the exploit, we examine the memory in the debugger to find that the kernel has written the address of the shellcode in the HalTable which then gets executed. The below diagram shows program halted at the breakpoints as per the code. When a program calls a heap allocated memory after it has been freed or deleted, it can lead to unexpected system behavior such as exception or arbitrary code execution. At some point an object gets created and is associated with a vtable then later the object gets called by a vtable pointer. If we free the object before it gets called the program will crash when it later tries to call the object (eg: it tries to Use the object After it was Freed – UAF). Coelescing: When two separate but adjacent chunks in memory are free, the operating system con-joins these smaller chunks to create a bigger chunk of memory for effective utilization. This process is called coalescing or Defragmentation. This would prevent the occurrence of Use After free bugs since the program memory won’t then allocate the designated memory or call it. 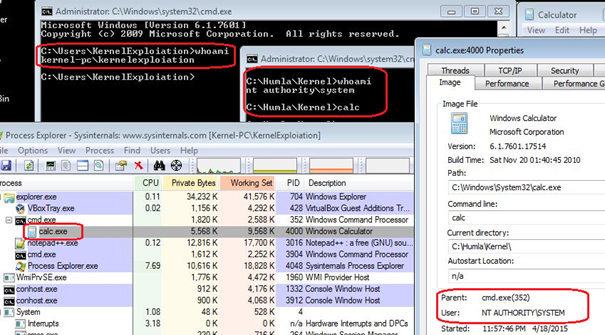 Below example demonstrates such an exploit: We have the debugee running as normal user/administrator. To trigger the Use After free bug we will have to first allocate the vulnerable object in the heap, free it and force the vulnerable application to use the freed object. Figure 18 Use After Free Object assigned. Waiting to free it. Following this we free the object and fill all the freed chunks created in the pool. This takes some time as for the purpose of demonstration this was done around 100 times. We all reallocate the UaF object. Meanwhile, the chunks have been filled by our pointer, in the debugger we can see the structure of the HackSys object as it looks after filling the gaps we created. Get address of Process member (KPROCESS). It contains the Token value and is at an offset 0x40 from the KThread base address.